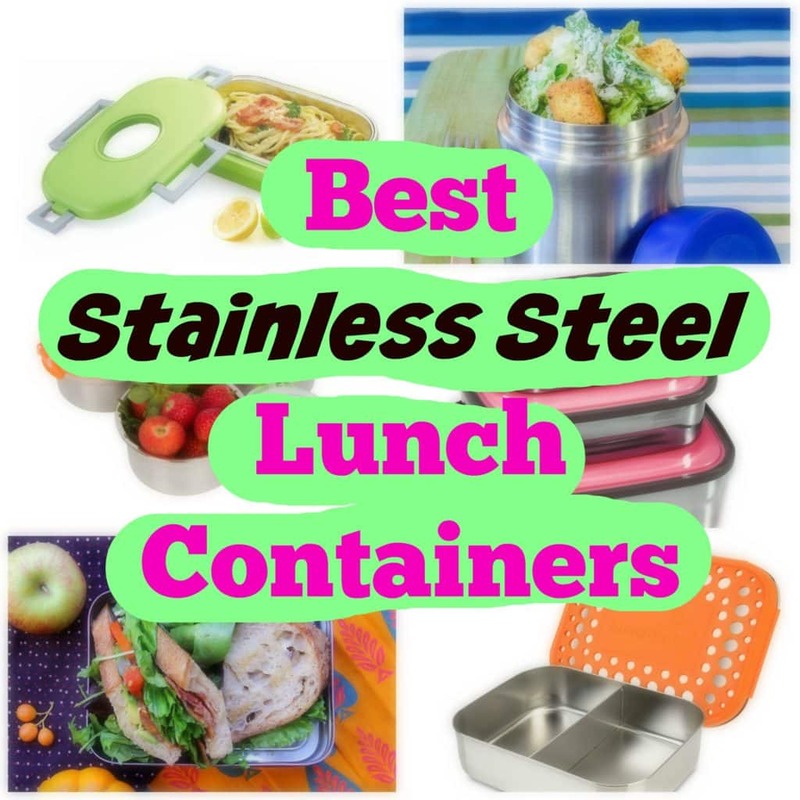 Best picks for stainless steel lunch containers and non-toxic food storage. The best stainless steel lunch containers to tuck into your purse or kid’s lunchbox are stylish, economical and non-toxic. After all, who wants to reuse the same old thin plastic lunchbox container that is scratched, broken or chipped? Plastics are made of not-so-great stuff – none of which you want to ingest along with a PB & J. Stainless steel – the workhorse of kitchens for generations – is strong, durable, and won’t fall apart in a dishwasher after the third wash. It’s not going to stain from the pasta sauce that you put in a lunchbox container. And it will stand up to the beating, dents and dings that lunch containers take from both adults and kids alike. 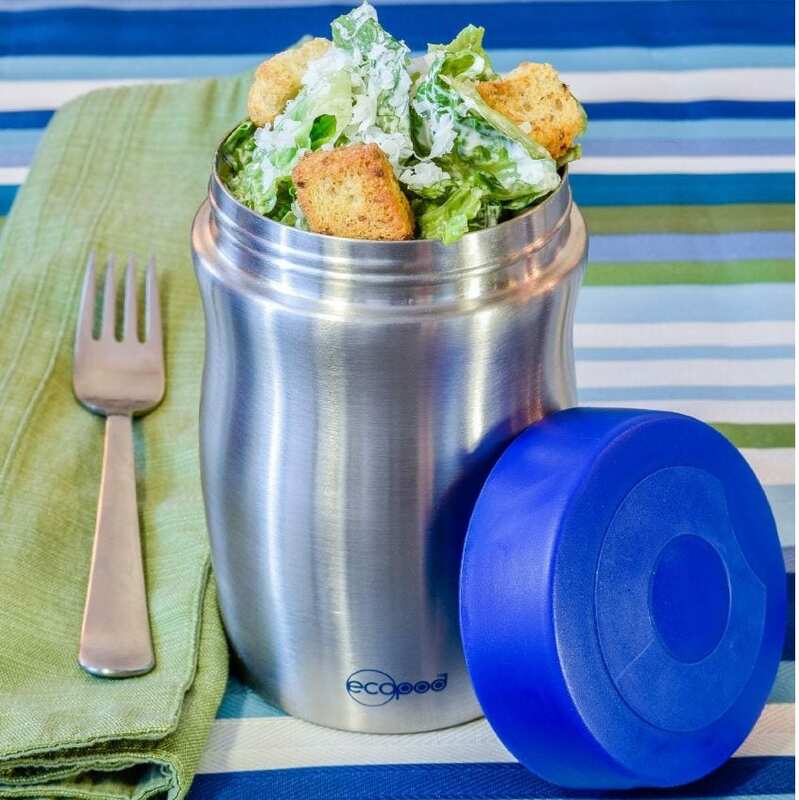 According to a study by ECOlunchbox, a family could save up to $450 in one school year by using eco-friendly stainless steel reusable lunch solutions, rather than disposable plastic containers, bags and utensils. Even better? Many of these non-toxic stainless steel lunch containers can go in the dishwasher (always check for the manufacturer recommendations)! No more hand washing fragile plastic lunch box containers to keep them from cracking or leaching chemicals. 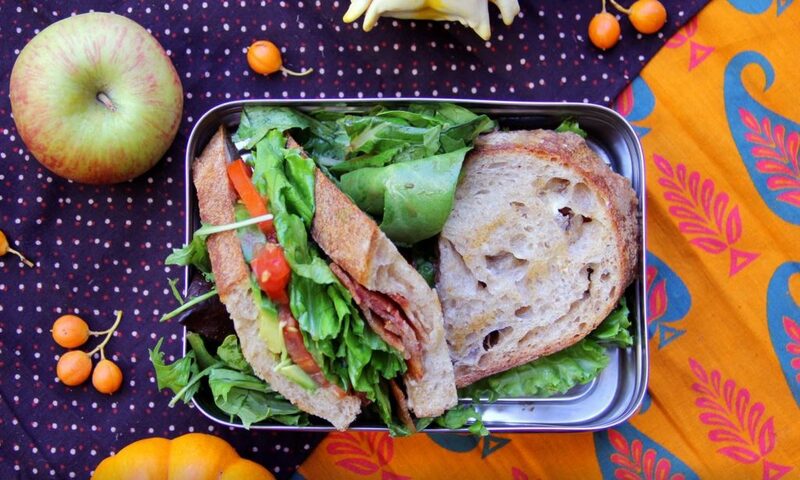 So these stainless steel lunch containers save you 5-10 minutes a day! Who doesn’t need a time saver in their life? 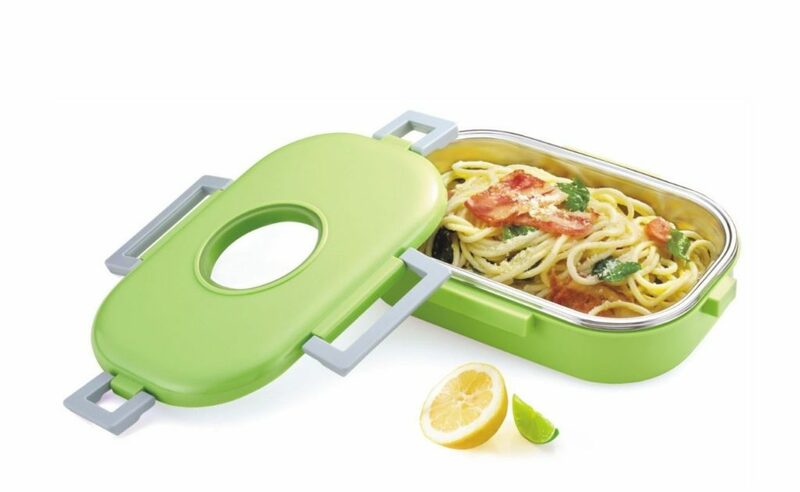 I already own a LunchBots stainless steel lunch box container. It’s old school and not even made anymore. And it’s still awesome! These new stylish and modern snack containers have a divider inside to keep foods separated. The decorative cover comes in many colors, as well as classic stainless steel. The colorful covers can be removed for easy cleaning, or left on. I think they add a bit of joy to your lunch time routine! So when I recently discovered that Klean Kanteen makes insulated food canister containers for keeping food either hot or cold, I knew that they’d be winners. Back in the day when mom used to pack my school lunches, it was a really big deal when we got hot SpaghettiOs in the lunch box. (Did you know that they make organic SpaghettiOs now?!? Yep, they’re in my emergency food stash for disasters.) That meant that it was a special day. While my food choices have changed since elementary school days, my connection and memories of a hot soup or pasta for an on-the-go lunch remain. Being able to pack a hot lunch in a non-toxic food container gives me the warm fuzzies (and keeps my food really warm – or cold, too!). We were RVing across the country last year. There were many times when I heated up a meal (often one of these Non-GMO Lean Cuisine meals) and packed it in my Klean Canteen insulated container. Then I could have a hot lunch even though we were driving several hours to our next destination. In all honestly, we tried packing ice cream in our insulated container to go hiking. I only put in a scoop and didn’t pack it tightly with food. When we opened it up hours later, the ice cream had melted. It was cold, but had melted. 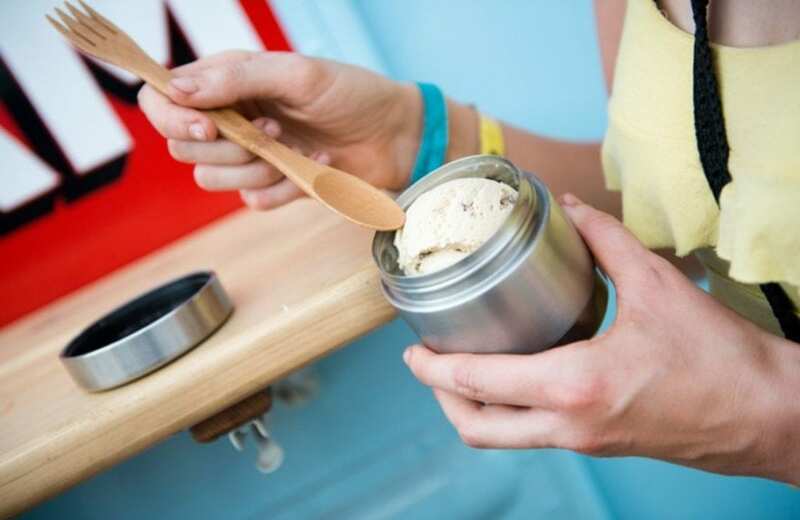 So definitely pack it tightly if you’re going to try ice cream or something frozen like that! Bright, colorful and with a strong seal to keep all the food inside the lunch container, these stainless steel lunchbox containers are slightly insulated, too. The big latches make opening the container easy. A silicone seal helps keep food fresh inside and prevent liquids and sauces from leaking out of the container. 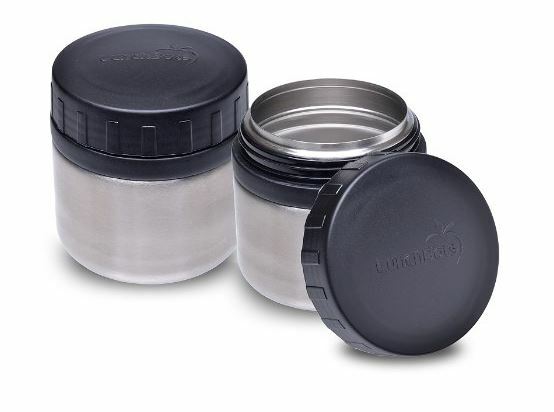 These no frills stainless steel containers are just that – stainless steel. There are no insulation properties, or silicone seals to hold liquids and “wet” foods in without leaking. But perhaps you’re looking for sleek, minimalistic design? Then these are for you. FYI – I’ve seen these sold in The Container Store, too. Insulated lunch box containers mean you can mix up the lunch routine and add in hot soups or pasta, and cold crunchy salads. Insulated containers like this one from Ecopod keep cold foods cold and hot foods hot. Reviews say that it even kept ice cream solid for two hours! Leakproof lids for messy foods are the highlight of these snack-size lunch box containers with see-through lids and brightly colored tabs that are kid-friendly. 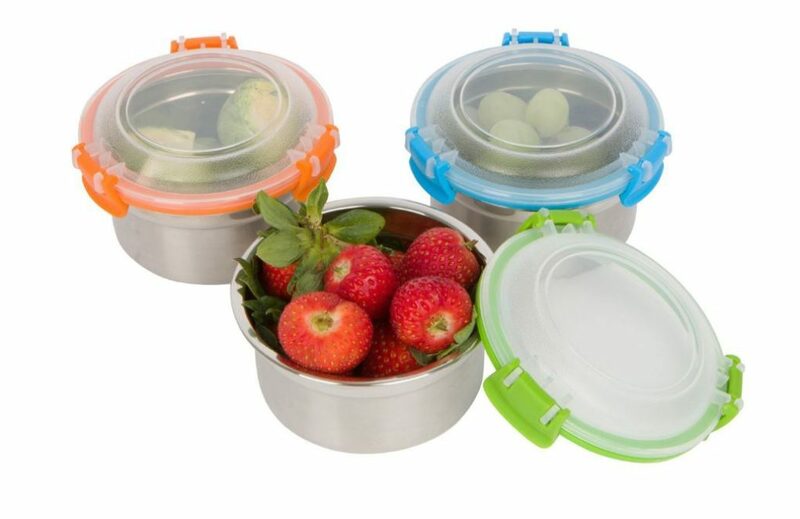 The perfect accompaniment to the lunch box containers for your salads, sandwiches or other entrees, these snack-size containers with a screw tight lid are where you stash your chips, pretzels or candies for that little bitty indulgence to get you through your afternoon. 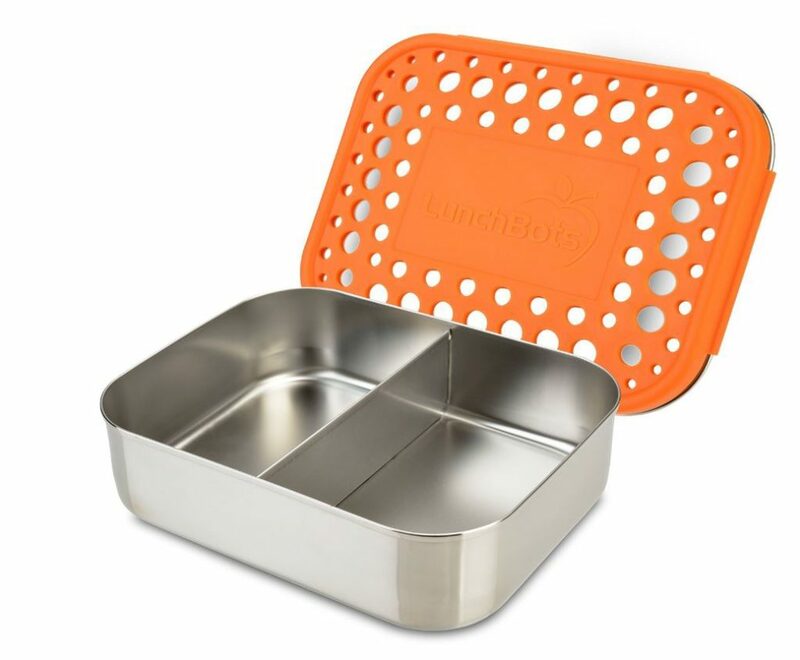 Already have a stainless steel lunchbox container? Which brands do you love? These containers look really cool! I’m slowly getting some, leaning more towards glass, but like the look of stainless for some things. Hi Kimberly! This is such a great post! I had no idea there were so many great ss containers out there. I recently got rid of all my old Tupperware and have been switching over to glass for food storage. I’ve been wanting to get something for packing my husband’s lunches, but I didn’t want glass for that. So I’ll be checking these containers out. I’m really surprised to see that Tupperware has stainless containers. Pinning and sharing this. Thank you! Thank you! Yes, I was surprised at Tupperware, too!!! Who knew that they had stainless steel?!? Thanks so much for sharing! Hope you find something great for your husband!!! !